"Scott Goodson and his StrawberryFrog colleagues have found the secret to plugging into Purpose with a capital P: find out what moves people to action, then create a way to support and enhance that movement with your product, service, or craft. I call that a winning strategy." "Want to change your customers' buying habits? Want to change the world? Stop marketing, read this book, roll up your sleeves, and start a movement." "Essential stuff. One of the smartest thinkers on branding on one of the most important developments in that critical intersection between culture and marketing." 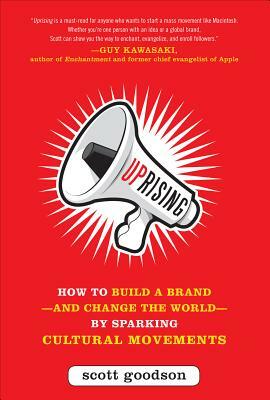 "A well-researched and insightful book that will hopefully spark a movement against traditional, stodgy marketing. A must-read for the new generation of marketers who will be defining tomorrow's marketing landscape." Movement marketing is changing the world. It's the new way forward for anyone trying to win customers' loyalty, influence public opinion, and even change the world. In Uprising, Scott Goodson, founder and CEO of StrawberryFrog, the world's first cultural movement agency, shows how your idea or organization can successfully ride this wave of cultural movements to authentically connect to the lives and passions of people everywhere. We are in the midst of a profound cultural transformation in which technology is making it easier than ever for anyone to share ideas, goals, and interests. Working with companies and brands ranging from SmartCar to Pampers to Jim Beam to India's Mahindra Group, StrawberryFrog and Goodson have led a paradigm focal shift away from one-on-one selling to sharing. Scott Goodson is the founder of the pacesetting global marketing/advertising agency, StrawberryFrog. He has built some of the world's most iconic brands, lectured at Cambridge University, Columbia Business School, and addressed marketing and communications conferences around the world. Follow him @ScottFrog.